Montevideo was founded in 1724. For much of its early history, the city consisted of what is now known as the Ciudad Vieja (Old Town). By the mid-19th century the city began to grow eastward towards what is now known as Centro. The demolition of the old fort that used to mark the eastern boundary of Old Town enabled the construction of what is now Plaza Independencia. Eventually Boulevard Artigas was built around Centro, but by 1910, suburbs were already developing beyond it which were later annexed into the growing city. Carrasco International Airport (IATA: MVD) is about 15 km east of the city center, in the suburb of Carrasco in the department of Canelones. The airport is linked to the city center via major four-lane divided arterial roads. Route 101 (the national highway running by the airport) terminates at a roundabout where it connects to Avenida de las Americas, which in turn connects to Avenida Italia, which runs all the way to Centro. People used to complain all the time about Carrasco's dilapidated and overcrowded old terminal. In 2009, Carrasco Airport opened a beautiful new terminal and expanded to eight gates (four jetways, four remote parking spots). Unfortunately, to pay for the $134 million terminal, the government sold a lot of bonds backed by a USD $40 ($19 for flights to Buenos Aires) airport fee charged to all departing travelers. Based on where you are from, some airlines already include this fee in the price of the ticket (in the United States it is mandatory), but if your airline did not already charge you the fee, you will be required to go to the airport fee counter (next to the check-in counters) and pay the fee before you can leave the country. You should be able to look at a fare breakdown of your ticket to see if this fee has been included (look for code WU in the tax lines). 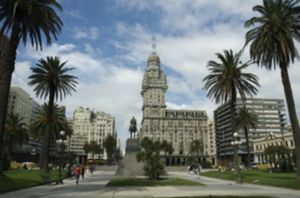 By remise Rate from airport to Downtown around UYS 800/950 (Uruguayan Pesos) or USD 40/45 (Us dollars) (http://www.bybremises.com), (http://www.airporttransfer.com.uy). The airport taxi to the center costs UYU1500 or USD70; metered and prepaid prices are about the same as of September 2012. Payment in USD is possible, but using UYU works out to be about 10% cheaper. During weekdays one can take the normal radio taxi from the city to the airport for around 800 UYU, but be careful because some cab charge extra for carrying his bag and the other problem that the vehicles are small because using a security screen between the front and back . Montevideo is connected to Buenos Aires by a straight ferry service operated by Buquebus, 2h, one-way tickets sold for around 2.000 ARS (107 USD) as of December 2017. The ferry arrives in the Ciudad Vieja district of Montevideo, situated very close to downtown. Much cheaper is to take a combination of bus+ferry using the cities of Colonia, Nueva Palmira or Carmelo as port of call - the option through Carmelo operated by Cacciola, one-way, sold for 650 ARS (35 USD) as of December 2017. Check the section "by boat" on the Buenos Aires page for detailed information. It should be noted that doing the route Montevideo-Colonia-Buenos Aires independently is easy and hassle free. High-season prices for the 1h express service between Buenos Aires and Colonia retail for around 1.000 ARS (54 USD), but if you book well in advance via internet, you can get it for around 500 UYU. Once in Colonia, the bus terminal is located besides the ferry terminal and there are buses to Montevideo Tres Cruces terminal every hour (270 UYU or 10 USD, 2h30 directo/express service and 3h parador/normal service). Colonia has a cute old town at walking distance from the bus & ferry terminal that can be comfortably visited in a couple of hours. Bus to Salto - 6 hour direct transfer is 640 pesos with Agencia Central SA (June 2012) - several departures throughout the day/night. Bus to São Paulo - a 28 hour trip leaving every Sunday, serving cities like Florianópolis and Curitiba on the way, operated by EGA. Bus to Santiago de Chile - a 27 hour trip leaving every Monday, operated by EGA. Bus to Asuncion -a 26 hour trip leaving four times a week, operated by EGA. Bus to Colonia del Sacramento. Departures every hour, operated by two companies: COT and TURIL. There are two services: Directo (no stops, time travel of 150 min) and Parador (stopping in all towns on the way, taking over 3 hours). Bus to Punta del Este. Departures every hour, operated by COP and COT, taking about 2 hours of travel. Most services are direct, but some make a stop at Piriápolis. For those leaving from Porto Alegre, Brazil, there are two options: one that enters Uruguay via Chuí and another via Jaguarão. For both, you start by taking the route BR-116 up to Pelotas. Next, if you want to visit Chuí, the southernmost city of Brazil, or the Santa Teresa Fortress or even see the beautiful beaches of the coast of Uruguay, then, at Pelotas, take the route BR-392 to Rio Grande and next the route BR-471 all the way to Chuí. Takes about 6 hours and 30 minutes to go from Porto Alegre to Chuí. On June 6th of 2010 there were 5 tolls between those cities, a total of R$ 34.60 (it's important to note that they only accept Brazilian Real). Around 30 minutes after crossing the border, you can visit the Santa Teresa Fortress. An option is to stay a night at Punta del Diablo, in case you are too tired to keep driving to Montevideo. From Chuí to Montevideo, just stay in route 9. Takes about 4 hours and 30 minutes. Again, there are 3 tolls between Chuí and Montevideo, each cost UYU 60.00. In this case, they do accept foreign money. However, it's strongly recommended that you pay in Uruguay Pesos, as they charge a lot more if you pay in Real or Dolar. If you want the fastest route to Montevideo (about 2 hours shorter than the first one), you should cross the border at Jaguarão. To reach this city, just stay in route BR-116. After that, take route 8 to Montevideo. Montevideo is not a large city and it boasts a very efficient public transportation system so getting around is not difficult at all. If you are not bashful about your Spanish, feel free to ask people which bus route you need to take to get to your destination as it can be the most effective and cheap option (UYU $38 as of January 2019). Alternatively if you know some Spanish there are two websites similar to Google Maps that are useful: Cómo ir  and MontevideoBus . In addition there are both iPhone (Bondi ) and Android (SoloBus ) apps to help navigate the bus system. It is useful to know that if you choose to ride a bus, upon boarding you will pay either the driver or the assistant who sits on the right-hand side of the bus (door-side) a few seats from the entrance. There is a small device that will dispense your receipt, make sure you hold on to it for the duration of your ride as sometimes company supervisors board buses checking for these receipts (making sure no one is riding unauthorized). If you are unsure where to get off you can always ask the driver or assistant to let you know when your stop is coming up and they'll be happy to oblige. Just try to remain visible so they can tell you (though if the bus gets full and you've moved to the back they'll yell out the street name). It is also important to note that you do not need to have the exact fare as the driver or the assistant carry change. Of course, expect disgruntlement if you pay with a large bill. The city's central terminal is called Tres Cruces. Aside from being a full-fledged mall, it sports companies with fully-equipped tour buses that can take you anywhere in Uruguay and even into neighboring countries. Expect UYU $376.00 one-way to Colonia, about 2 to 3 hours. Efficient and on time. All destinations, timetables and hours are available online . Any bus from the airport marked "Montevideo" will reach Tres Cruces in about half an hour and cost 56 pesos. It helps to ask the bus driver to inform you when to get off because the Tres Cruces terminal building is rather nondescript from some sides and you may miss it. Taxis are plentiful but not too cheap (gasoline is expensive in Uruguay). It helps to know a little Spanish. A ten-minute cab ride costs about UYU100. Taxis are metered and upon the end of your ride you are shown a chart depicting distance and cost (though on some vehicles this chart will be on the window between you and the driver). Generally there are two fare schedules. The first is for Monday-Saturday from morning to mid-evening. The second fee schedule is for Sundays and late at night, and is slightly more expensive. Tipping is not expected, but you might round up to an even number to be polite. It is also not uncommon to sit on the front. Car rental is cheaper if booked ahead but be aware that places like the airport and the ferry terminal charge higher rates than the same agencies in other locations around the city. A few phone calls and a cheap taxi ride to a location other than the air or sea ports will save you half the rate for the same car at the same company. Driving in Montevideo is not too difficult, especially for those visitors from Europe or developing countries that lack strict lane enforcement and have lots of roundabouts. (Visitors from countries with few roundabouts and strict lane enforcement, like the United States, will find it baffling at first.) Road traffic in Montevideo is amazingly light outside of rush hour, and even during rush hour is relatively good compared to, say, North American cities of similar size. It is not too hard to find parking in most of Montevideo. Indeed, if you do not see a "Reservado" sign, or red and white stripes or red paint on the curb, you can safely assume that one is allowed to park at any particular curb. The only major obstacle for visitors is that from Monday to Friday, from 10 am to 6 pm, there is a "Estacionmento Tarifa" parking management system in place in much of the Ciudad Vieja and Centro. To pay the "tarifa" for parking look for or ask for the closest Abitab office (www.abitab.com.uy) and make sure you know the number of your licenced plate. As of early 2016, rates in Plaza Independencia (downtown/Ciudad Vieja) are roughly the equivalent of US$1 per hour. You can pay in UY$ or US$ with not much difference given the very small amounts. Ciudad Vieja — Montevideo's Old Town. Enter through the portal called Puerta de la Ciudadela at one end of Plaza de Independencia. Plaza de Independencia — The square at the end of 18 de Julio Ave., with the latter being the main commercial artery of the city. Palacio Salvo — Next to Plaza Independencia. Once South America's highest building, the Palacio Salvo still dominates Montevideo's skyline. Mausoleo de Artigas — This large monument in the Plaza de Independencia pays tribute to José Gervasio Artigas, one of the heroes of the Uruguayan Independence. Under the monument is the mausoleum, which is open on the weekends. It contains an urn with his ashes and two honor guards keeping watch. El Día del Patrimonio, — On the last Saturday of September (or beginning of October), all the museums and historical places of interest around the Plaza de Independencia open for free to the public. There is also a large "Murga," or a traditional South American parade in which all the Uruguayan political parties take part. MAPI  - museum of indigenous art and Uruguayan archaeology. Museo Torres Garcia  - displaying works of this most prominent Uruguayan artist. Barrio Reus - a small neighbourhood with charming coulorful houses. Palacio Legislativo - national parliament, the first one in South America and an iconic symbol of Uruguay´s long lasting democracy. Museum of Natural History  - built in the form of a mosque and located at the beach promenade. MNAV  - national museum of modern Uruguayan art. Fortaleza General Artigas  at Cerro - it now houses a collection of armoury. It is the original fort from which Montevideo originated. Palacio Taranco - seat of the Museum of Decorative Art. Mercado del Puerto  - this is a covered market full of restaurants and some shops selling handicrafts. The main market is open every day during lunch hours. The restaurants around the exterior offer both indoor and outdoor seating, and they remain open for dinner. Intendencia de Montevideo - Montevideo city hall, with a free rooftop terrace offering great views of the city. To reach the terrace, take the elevator to the highest (tenth) floor, and follow the sign for Mirador. You have to climb up the last floor on foot. Walking — Montevideo is a relatively safe place. The city is built on a slight hill, the spine of which extends into the Rio de la Plata to create the point that was the original city (Ciudad Vieja). From the Plaza de la Independencia, the main street that extends east from the plaza is 18 de Julio Ave. El Centro (downtown) is in this area and there will be lots of shops and places to change money. You can walk around without worry almost anywhere, and there are lots of side streets and areas you can explore: be aware that the port area, just off the main tourist and port terminal areas, is considered dangerous by locals as much as by the police. Parts of the city may appear run-down, but do not confuse this with it being a bad neighborhood. Along with Buenos Aires, this is one of the few cities in South America where poverty is not overly prevalent. That being said, there is simply not enough money in Uruguay to construct lots of new, modern buildings, so buildings are kept in use for long periods of time. Montevideo City Tour — Regular  or Private City Tour  around Montevideo or visiting wineries, Punta del Este or Colonia del Sacramento. Montevideo Leather Factory, Plaza Independencia 832, + 598 2 908-9541 . This factory has a wide range of leather garments at reasonable prices, and they offer custom-made jackets tailored to your measurements in 24 hours. Opening hours: SAT till 1700hrs, SUN till 1400hrs. Punta Carretas Shopping Mall — A large shopping mall located in a former prison where the military regime used to torture dissidents. It has several levels, a food court, cineplex and full-service dining options. It is currently the most upscale mall in Uruguay (although still small by U.S. standards) and features several boutiques for international fashion brands. The Sheraton Hotel is connected to the mall. The mall has ample parking, but because the developer had to build around the existing prison as part of the development deal, the parking garages are very confusing and difficult to navigate. Montevideo Shopping Mall — Another large modern shopping mall in the Pocitos neighborhood of Montevideo. It has one huge parking garage (which is easier to navigate then Punta Carretas) but is not quite as upscale. The not-so-big capital of a small country that is not often in the international news, and while not exactly a world center of gourmet gastronomy, Montevideo is a city where one can eat wonderfully and relatively cheap, with plenty of local character (no, it's not the same cuisine as in Argentina), yet not too exotic for most tastes. Meat — Uruguay is renowned for its meats, and Montevideo has many parrillas where they are grilled up to perfection. Although both Uruguay and Argentina are large exporters of meat, especially beef, and their meat is renowned for its top quality, they still keep the best for themselves, while also being masters in the art of grilling it. So, only going there can you eat the best meat and taste for yourself how outstandingly good it is. Steaks (bifes) are typically served medium-rare, so if you like them well-done, be sure to specifically ask for that (bien cocido). Chivito — This is the local sandwich, made with meat (usually beef tenderloin, not goat as Argentines might guess from the name), slices of hard-boiled eggs, and vegetables. It can be served al plato (on a plate), which means it is going to take a fork and knife to eat it. Like a hamburger, it is traditionally served with fries, but it is tastier, cheaper and much bigger than a hamburger. 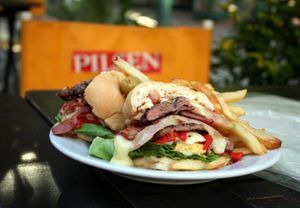 Several guidebooks (correctly) call the chivito a "cholesterol bomb." After eating one or two of these delicious monsters, you will begin to understand why so many elderly Uruguayans have pot bellies (not from eating at McDonald's). Marcos Chivito is one of the best places in Montevideo to get these tasty treats, as well as La Mole, and some Carritos. An excellent choice is to try chivitos in Bar San Rafael. Milanesa — similar to Wiener Schnitzel, this is a common meat dish in most of South America, including Uruguay. It consists of a thin slice of breaded beef although chicken and fish versions also exist. Each slice is dipped into beaten eggs, seasoned with salt, and other condiments according to the cook's taste (like parsley and garlic). Each slice is then dipped in breadcrumbs (or occasionally flour) and shallow-fried in oil, one at a time. Some people prefer to use very little oil and then bake them in the oven as a healthier alternative. Sometimes it may include a fried egg on top. A popular variation is the milanesa a la napolitana. It consists of a beef milanesa topped with ham, cheese and tomato sauce. Fresh Pasta and Fresh Gnocchis — they are everywhere on the menus, with all types of vegetarian or meat sauces... usually a cheap, filling and delicious option! Be sure to try cappelletti Caruso, a dish whose exact origin is controversial, but definitely invented by a Uruguayan chef decades ago, consisting of cappelletti (tortellini) in a delicious mushroom cream sauce. Desserts — In Uruguay, desserts are huge and plentiful. There is dulce de leche (a kind of creamy caramel, a totally addictive threat to diabetics, coming in several versions: lighter, darker, softer, thicker, plain or with vanilla or other flavorings, etc.) on almost everything and stores that sell nothing but caramels. Many places sell nothing but dessert, so pick the one with the best looking pastries and cakes and enjoy! Churros — Find them for sale at the Parque Rodó. Try the sweet versions - they come with sugar on top, or filled with chocolate, dulce de leche or cream filling - or the cheese-filled ones. Pizza — There are pizzerías all around Montevideo. Most make square pizzas, a traditional form in Uruguay. Muzzas (mozzarella) are most popular. The local style of dough is sometimes soft and airy as bread, but still crusty, and not merely "baked," but wonderfully gratinated with the excellent Uruguayan cheese (see below). Look for pizza places that are fullest of local customers - often, it's the simplest nondescript places that serve the best pizza, and it can be really, really good! Fainá — It's a mixture of chickpea flour and milk, which is baked in the pizza oven. Quality is varible among pizzerías, most delicious is the thin or de orilla ("from the edge") part which is crunchier! Cheese — Yes, just cheese. Uruguay has a traditional and strong dairy industry, and although the varieties are mostly the better-known European ones, such as mozzarella, Gouda or Parmesan, quality is usually superb. As in France, just dropping by a supermarket and buying some bread, butter and cheese can make a surprisingly cheap and delicious meal. And yes, there are also restaurants specialized in many international cuisines, as well as some gourmet places run by talented chefs - as well as American fast food chains. K Fe corner of Edil Hugo Prato and Dr. Mario Cassinoni, phone: 224025887 Cordon area: You will feel like in Lavapiez in Madrid, Friedrichshain in Berlin or a Melbourne back alley. Enjoy a coffee in the afternoon or a home cooked meal (always veggie option) in this unique rotiseria cultural in the hart of the city. Clothes, design, exhibition, roots, dub, dubstep, urban art. Open from 12 pm to 2 am. Café Bacacay  — located very close to Plaza de la Independencia, right across the Teatro Solis and open all day for a coffee or a bite to eat, this café/restaurant offers a variety of very tasteful dishes going from traditional to more innovative cuisine. Service was excellent. La Corte — Classic restaurant (not fast-food) in the Ciudad Vieja, with lovely decorations and great food. Mate — Pronounced "MAH-tay," this traditional hot infusion is ubiquitous, found everywhere in Uruguay. Mate is derived from the dried eponymous herb (yerba mate), which was originally used by the indigenous Guaraní people from southeastern South America. Although the word yerba means "herb" (any herb) in Spanish, when a Uruguayan says that, it's usually the mate herb one is talking about. Mate is traditionally brewed in a gourd and drunk directly from it with a special silver straw that also filters out the herb bits. It is also drunk in Argentina, Paraguay, and southern Brazil. It contains a lot of caffeine and similar stimulants; so, if you're not used to it, it's advisable to avoid it in the evening. Most locals in Montevideo prefer to drink their mate without sugar, called a mate amargo ("bitter mate," though much less bitter than the name suggests). Gourds and horns are constantly being refilled with the brew from sun-up to sun-down. There is also a much less popular toasted, milder-tasting version (mate cocido) that is prepared and drunk in cups just like English tea (it often even comes in teabags), often sweetened. Salus — A mineral water bottled in Uruguay. If you're a little apprehensive about drinking tap water, this is a great way to go! Beer — Beer is often sold in 1 liter bottles. You basically have a selection of typical lagers. The most commonly found are Patricia or Pilsen, with Zillertal also often available. You can also order a chopp, which is a draft beer (and if not specified, it is normally Patricia). A couple of years ago, a new wave of craft beer bars invaded the city with a wide selection of local beers made by small producers. A pint on one of these bars costs UY$150/USD$4.7). Uvita — A specialty of Bar Fun Fun, a liquor drink served in a shot glass and tastes of raisins. It is a secret recipe and only served at Baar Fun Fun. Fully Equipped Short Term Apartments, Calle 21 Septembre in Pocitos, +598 99 600-455. Very central and in a good neighborhood. Perfect solution if you plan to stay for several days and want to have the comfort of your own home. Ibis Montevideo, Calle La Cumparsita 1473, +598 2 413-7000 (fax: +598 2 413.6245, email: <[email protected]>) . A 5-minute walk from the old town, this chain hotel has simple but comfortable rooms and is bookable over the internet..
Radisson, Plaza Independencia 759, +598 2 902-0111 (fax: +598 2 902-1628, email: <[email protected] >) . Located heart of Montevideo's financial and commercial district. Features include a pool, gym, high-speed internet, and views of the city from the Restaurant Arcadia, located on the 25th floor. Casa Sarandi Guesthouse  (email: [email protected]) Intimate art-deco style guesthouse with just three guestrooms. All rooms are large with private bathrooms, great beds with imported linens and antique furniture. There's a cosy living room and a fully-equipped modern kitchen. The owners specialise in orienting guests to the city with a personalised check-in, handouts and daily recommendations of things to do. Room with ensuite bathroom 89 USD per night. Nh Columbia Hotel, Rambla Gran Bretana 473, +598 2 916-0001 (<email: [email protected]>) . This hotel is near the Ciudad Vieja with views of the Rambla. A modern hotel with a huge breakfast and free internet access, it has plenty of parking and a friendly staff. Colonia - A pleasant little World Heritage colonial town. A nice chance to get away from the noisy city and relax for a while. Two hours away by bus. Punta del Este - South America's most elegant and sophisticated beach resort, bustling and frequented by the rich and famous from all over the world in summer (November-February), quiet and almost deserted at other times of the year, but always beautiful. About two hours away from Montevideo with easy access and frequent bus connections. Piriápolis - Smaller, less famous, less sophisticated and quieter beach resort on the way to Punta del Este. One and a half hours from Montevideo. Cabo Polonio - Secluded village on the open Atlantic coast with difficult access and no infrastructure, but outstanding beaches and an alternative lifestyle. Too far from Montevideo for a day trip.